Why should you invest in seamless Gutters? The comfort of entering and leaving your home without getting soaked is a pretty good start however, there are several other reasons as well. Damage is caused to expensive landscaping, siding, doors, thresholds and garage doors due to splash back. Not all gutter companies are the same. Columbus Windows and Siding installs the best seamless gutter systems in Columbus. Our seamless gutters are manufactured on-site by a crew with over 30 years of seamless gutter installation experience. Again installation is the key to performance of gutters. 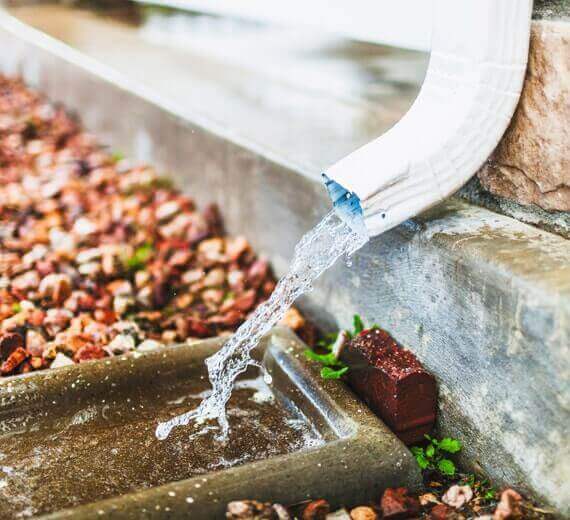 We can provide 5″ or 6″ gutters in a wide variety of gutter colors to enhance the look of your home. We use only the very best aluminum gutter coil, Mastic by Ply-Gem. It has a higher tinsel strength and a thickness. We also use hidden hangers inside of the gutters, not those unsightly spikes. If you are considering seamless gutters or gutter guards call us!Seamless Gutters are something you might not think about until you have problems. Gutters for the most part are out of sight and therefore not on your mind. If your gutters are leaking or are backed up it might be time to consider replacing the gutters or investing in Gutter Protection. For Seamless Gutters call Columbus Windows and Siding! Tired of climbing up and down your ladder? Tired of finding someone to clean the gutters? Why not protect your new seamless gutters with leaf protection. We have many types and styles to fit your needs. You also will not have to worry about you or someone else falling from your roof We carry $2,000,000.00 in Liability Insurance! Safety is rightly #1 on the list. Cleaning gutters is a hazardous task. There are many accidents while cleaning gutters, whether by falling off a ladder or from an electric shock from exposed electrical wiring as well as potential damage to walls, fascia boards, roofs and yes even the gutters. So the risk is not only of injury but also to the home as well. It makes sense to install something which eliminates some of the many risks of owning and maintaining a home. Prevent damage; Clogged gutters and ice dams can cause extensive damage to your home and property from overflows. The extra weight of the water can even damage the gutters themselves, apart from damage to your foundations, and erosion of your property as well as damage to walls and roof timbers from water flowing under the eaves or penetrating the roof because of overflows. A Great gutter guard system will not only protect against these problems but will actually strengthen the gutters of your home, making them better able to withstand the worst our changeable weather can throw at them. Good financial decision; Gutter protection is affordable and saves money spent on having gutters cleaned as well as time. It pays for itself in terms of cutting costs and effort as well as preventing damage to your home. So financially gutter protection systems justify themselves and make sense. Environmental issues; Leaves, twigs and other detritus which clog up the gutters provide a perfect environment for molds, spores and pests which can cause damage or evoke allergic responses in the occupants of an affected home or become invasive and start rotting the structure your home. Improved home value; It is expected that gutter guards are going to become a standard elements of any home. It will become more difficult to sell a home lacking gutter guards, or a reduced price might be necessary. In such cases it has been found that purchasers deduct more than the cost of installing the gutter guards to compensate for the hassle factor.Very few home purchasers want to do work on a new home. New homeowners just want to move right in and enjoy! It make sense to install gutter guards now and enjoy the benefits yourself as long as you live in your home, rather than wait until need or want to sell your home. March 7, 2017 /by Doug B.